Toronto city council has voted overhwelmingly to ban the sale of shark fin. Toronto city council has voted to ban the sale of shark fin in the city. The ban, suggested by councillors John Parker, Glenn De Baeremaeker and Kristyn Wong-Tam, will outlaw the possession, sale, trade and distribution of shark fins or their derivative products. The proposal passed easily - by a vote of 38 to 4. Shark fins are used in a soup that is often served at traditional Chinese weddings. Those who support the ban say sharks are killed inhumanely and often thrown into the ocean alive after their fins are sliced off. Those who opposed the ban say the soup is a traditional dish and insist the sharks are killed humanely. Before the vote Mayor Rob Ford said he didn't think it was the city's responsibility to ban the sale of shark fins and that he wouldn't support the motion. "I don't think it's in our purview to do that," he told CBC. "If other councillors want to do it it's an open vote. It's been going on for so long I don't know why it's an issue now." About 100 protesters showed up outside City Hall, claiming a ban would hurt the restaurant industry. The proposed bylaw will ban any use of shark fin and will impose fines ranging from $5,000 for a first offence to $100,000 for a third offence. 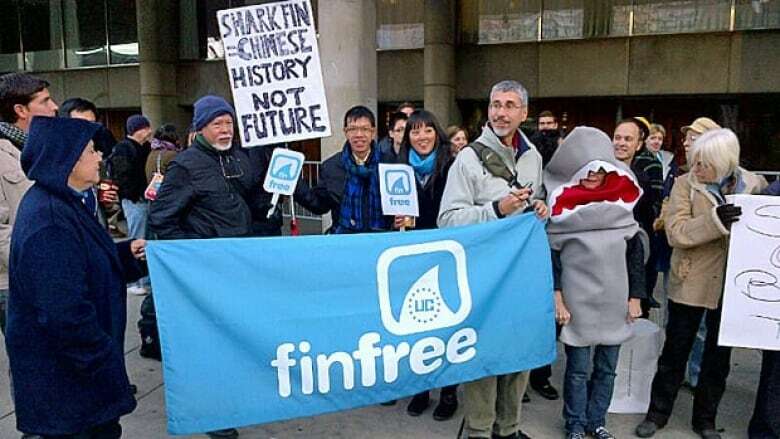 Some critics have argued that imposing a ban in Toronto will not end the problem since customers who want to eat shark fin soup will just travel to another municipality that doesn't have a ban. They argue that the federal government needs to impose a national ban on the importation and consumption of shark fin. Toronto is the fourth city in Ontario to enact a shark fin ban, joining Brantford, Oakville, and Mississauga.